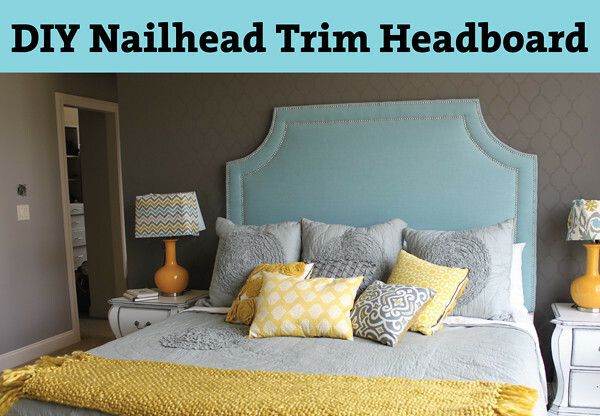 DIY Nailhead Trim Headboard Mama Say What?! | Mama Say What?! Oh, how I love my our headboard! Though my husband is a frugal guy, he is generally not very happy with anything DIY, partly because I was taking up the garage with all my projects. He is not one of those crafty, handy, electrical geniuses, so I also think he was scared of making something like that ourselves. 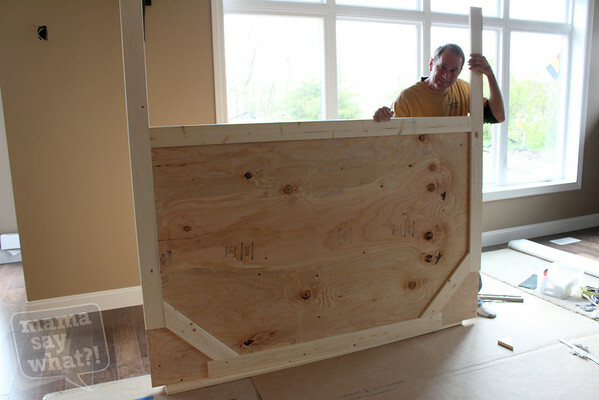 He gave me the go-ahead to purchase a $600 headboard I liked, but was not in love with… so I decided ‘no thank you!’ I was going to make one myself (without his help). My parents came to visit one weekend when he was out of town, so we got to work. I had all of the things we needed ahead of time, so it just took us one day to get it all done, even with a baby to tend to! When I got the plywood, I knew I had a king sized bed, which measures 70 inches wide, so I had them cut the plywood to 70 inches. 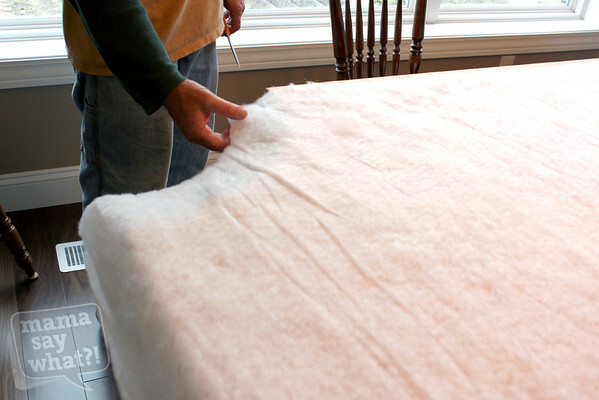 The batting and fabric will add an extra inch or two so it will still extend past your mattress a little bit. You can make it wider if you like. 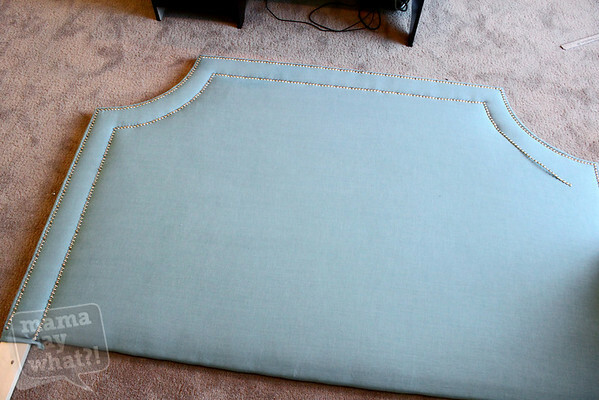 Now, I could have made it easy and stuck with a square headboard, but I knew my dad was handy with tools, so we decided to cut the corners out of the top of the headboard. He worked his magic there! He actually attached some string to the end of a pencil to draw the half circle (just like a protractor) so both sides would be the same. Then, he used a saw to cut off those pieces. 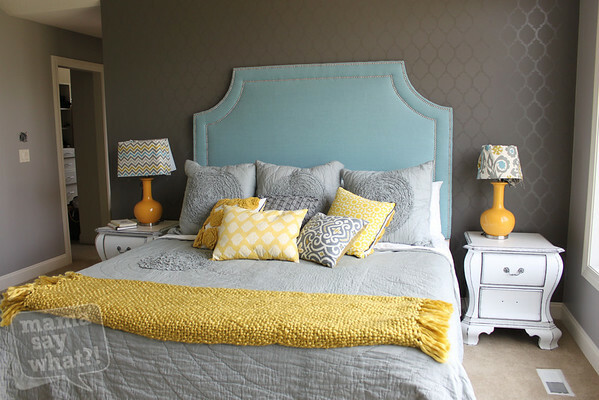 If you are going to hang your headboard, you can skip the next step. But my dad, being the perfectionist he is, decided he was going to build some legs for it to stand on so we didn’t have to nail anything into our brand new bedroom wall. Once assembled, we laid the headboard on my kitchen table so the sides all hung over. We spread the quilt batting out across the entire headboard. I used three layers of the quilt batting because I wanted it to be a little thicker. I used my new best friend, a staple gun, to adhere the batting around the entire headboard. Now comes the tricky part: laying the fabric. 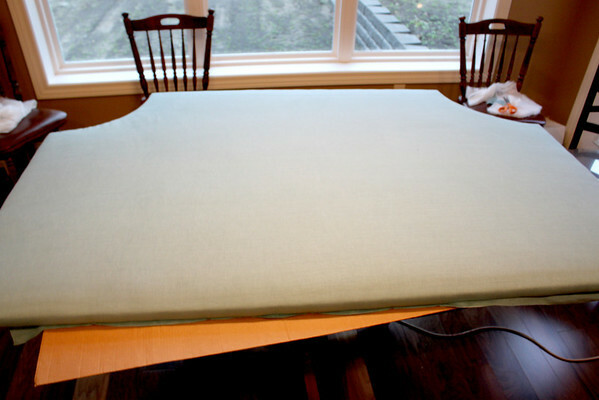 You can lay your fabric down on the table and put your upside down headboard over the top of it if you want to make it easier, but I wanted to be able to see the actual headboard and make sure there were no creases or folds in the fabric. 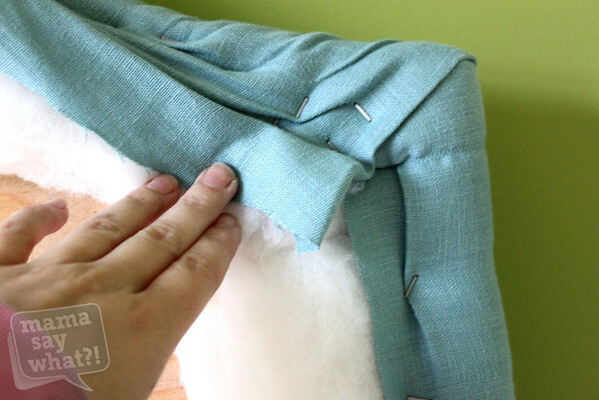 Lay the fabric over the batting and cut the excess off — making sure you have about three to four inches of extra fabric on ALL sides. Now before going crazy with your staple gun, you need help with this part. 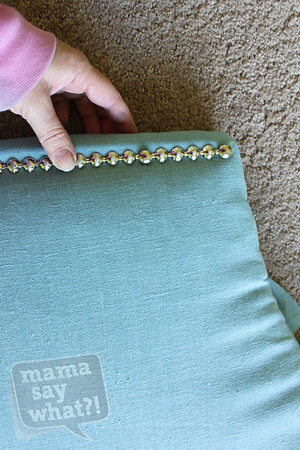 It is really important to have someone pull the fabric tight on the other side when you are stapling around your headboard, so you don’t leave any gaps of fabric anywhere. The corners were tough, but luckily my mom is a pro at wrapping presents (that’s what it felt like we were doing). 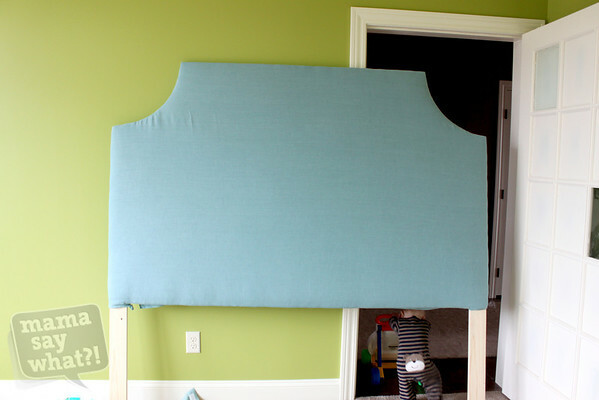 Obviously you will have to get on your hands and knees to staple the fabric to the underside of the headboard, but it goes quickly once you get the hang of it. As you can see, the back looks messy, but nobody sees that part anyway! After we attached the fabric, we stepped back to admire our work. Looks nice – but it needs the nail head trim for sure! This trim I got is great, as there’s a hole in every fifth (fake) nail, so you don’t have to sit there and actually nail down a million nails. Use a rubber hammer so you don’t scuff up the nails. 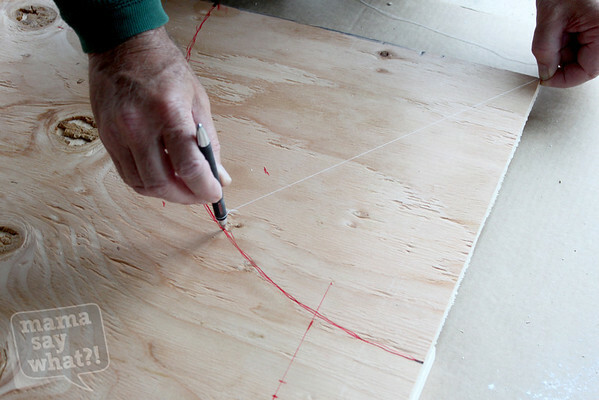 Just line the trim up around the outside edge and pound in every fifth hole with the nails that come with the trim. How does it look? People can’t believe we made it! I think it looks perfect in our bedroom! We still haven’t decided if we should cut a few inches off the legs, so it’s not as tall, but we are too lazy to get out the saw, so for now – it stays a tall headboard! Added by Heidi C. on December 22, 2012. I LOVE IT! I used your tutorial to make my own. Along with some other bloggers. I’m having a hard time keeping the nail trim straight. I used 2 inch foam and it is hard to get it nailed in. I’m going to try to place a straight piece of tape and see if that helps and start over. I’ve bent 4 nails so far. I am not using a rubber mallet, whoops. Wanted to tell you I love it being TALL! It is gorgeous! Thanks for posting and showing us the way! I need to make one for our bedroom!! Pingback: DIY Distressed Nightstands | Mama Say What?! Oh my goodness! It looks amazing! Quick questions did you screw the headboard into your bed frame or is it just laying against the wall? Hi Suzanne – thanks so much! The plan was to screw the legs into the bed frame, but it is actually just laying up against the wall right now. It’s been that way for the past few months and we haven’t had any problems with it, so it will probably stay that way now! Incredible!! 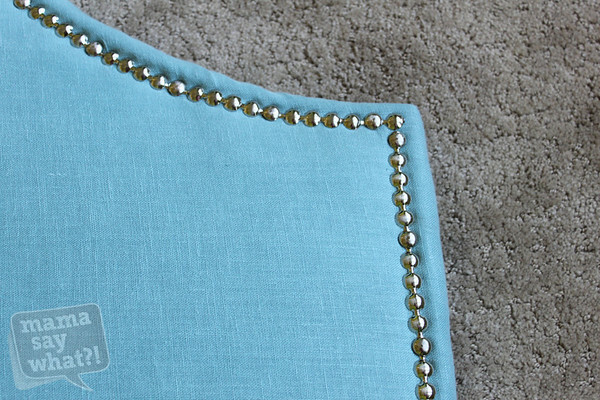 How many packages of that nailhead trim did you end up using? I’m thinking of making my own for a full size bed! Thanks Heather! 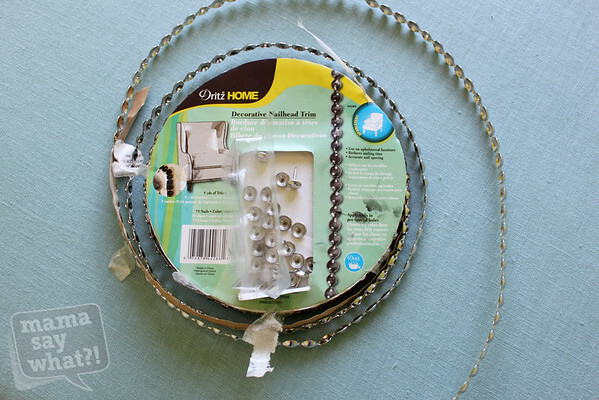 I believe I only used two packages of the nailhead trim. I ran out halfway through the second row so I am sure you could probably do a full size bed with just one package! This is beautiful!!! Do you mind telling the name/where you purchased the fabric? It’s exactly the color I’m looking for!! !